New technology Permair leather and leather look feature stretch panel on the back of calf perfectly contours to your leg. 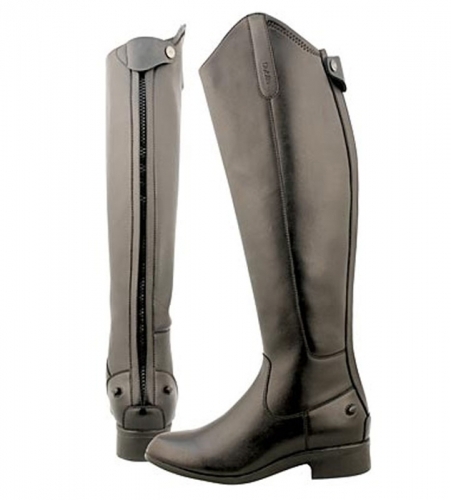 Modern Spanish cut topline and streamlined design allows immediate ankle flexion so no need to break in these boots. Durable leather which you can wipe clean for easy-care, representing real added value. These boots feature scuff resistant leather and are highly flexible in the entire boot, so it&apos;s comfortable to wear. Unique microporus finish allows feet to breathe more naturally for optimum comfort. They also come with RCS+ anti-slip rubber outersole for improved flexibility and insulation. New tech dress style boot with spur rest, easy entry zip closure. These boots are so stylish and comfortable, they really are a must have.